Cruz, an illustrator from Mexico City, imagines an Indigenous society far beyond what has been written in history books. Cruz draws inspiration from his own heritage, which is rich in myth and legend, stories he has heard throughout his lifetime; and he has used his imagination to create an extensive body of work. Most artists have a collection of finished art. Each piece takes its own time to complete, with each not being done until the artist is satisfied. However, This is not the case for Cruz, whose artistic impulses lead him to abandon rather than finish his artwork. Cruz’s primary influence is drawn from Mayan culture. 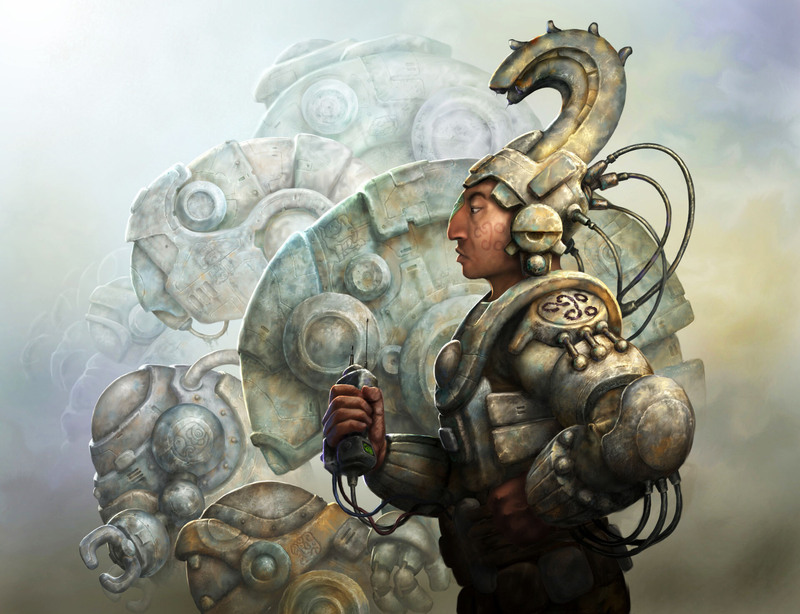 He uses Mayan motifs to create scenarios of Mesoamerican and Mexican Folklore with an occasional steampunk twist. Although he generally does not like to be classified, he says his art belongs to a genre called “Fantastic art,” a branch of science fiction. 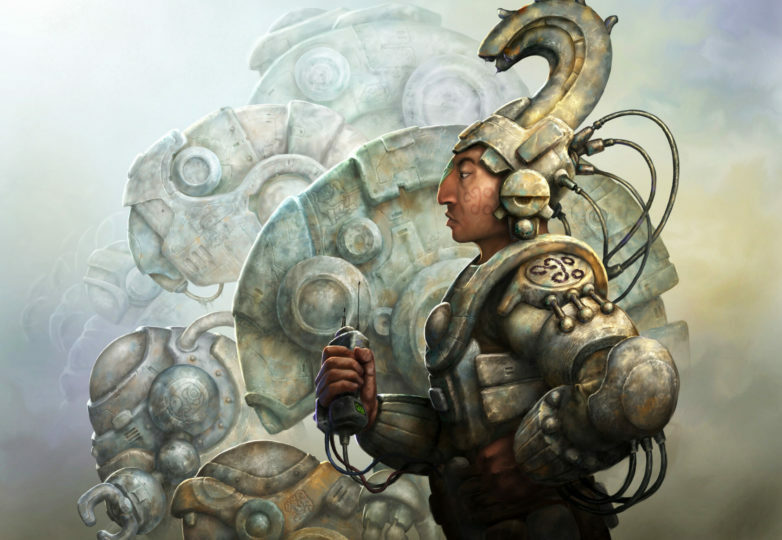 He said only a few works of his have been made with the intention of falling into the steampunk genre because the theme revolved around the Mexican revolution when steam engines were popular. “I like to know that by seeing my works, people enjoy some kind of journey through fantasy,” Cruz said. Cruz’s artwork stands out thanks to his trademark Mesoamerican style, which identifies him as an original Latino artist. 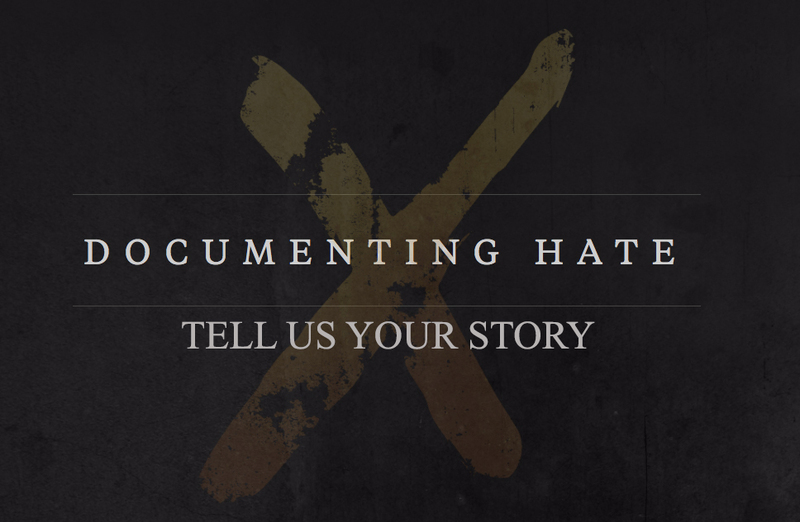 According to Cruz, one of the ways that he finds his art unique is by “a proposal of passionate origin, trying to show the art of my ancestors in a fantastic way.” He found pre-hispanic art, Aztec, Mayan, Teotihuacan and Olmec art through books, his schooling, television, archaeological sites he visited and most importantly through his family. In many paintings, Cruz portrays women as warriors, standing strong between worlds of imagery and reality. His intention is to showcase female strength in his ancestral culture. 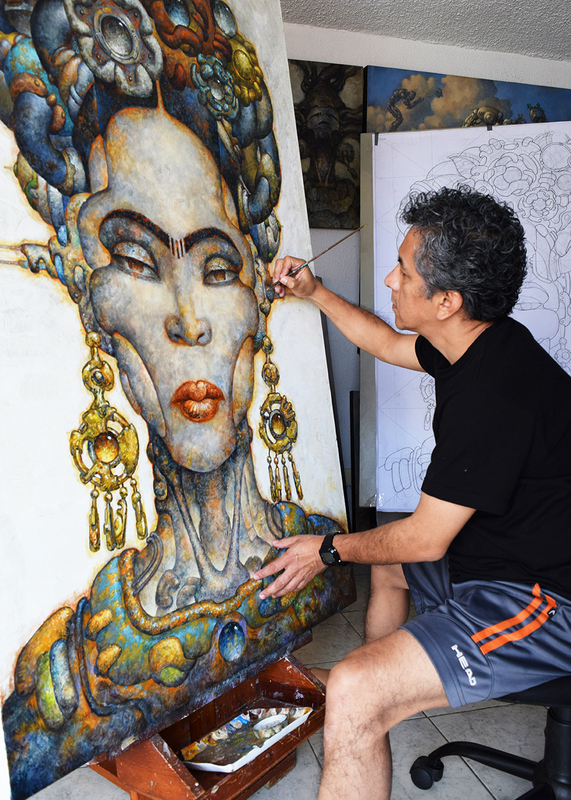 “I try to highlight my culture and its past, present and future history, with a Mexican woman who breaks with the stereotype of European beauty imposed by the media in Mexico,” he said. 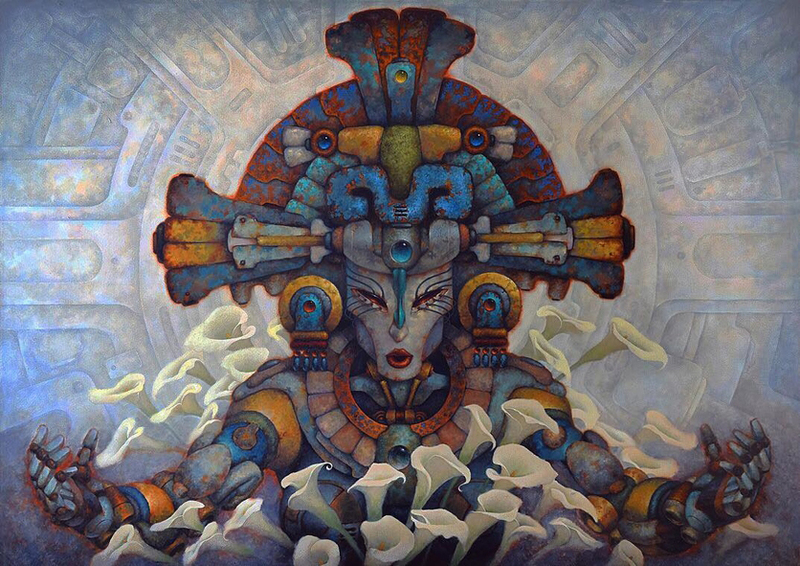 One particular painting depicts a biomechanical Virgin Mary, an icon in Mexican culture. The flowers painted beside her give the painting a mix of realism and humanoid, sci-fi fantasy. Cruz describes his childhood as imaginative and restless. He showed an interest for the arts early in his life, spending most of his time drawing or building. A self-taught artist, he had the support of his family to pursue his artistic career from a young age. His advice to future generations to find what they’re passionate about, follow their creative impulses against any situation that tries to stop them—be it money, prejudices, family, society, fashion, etc.—because, according to Cruz, creativity is an act of rebellion. 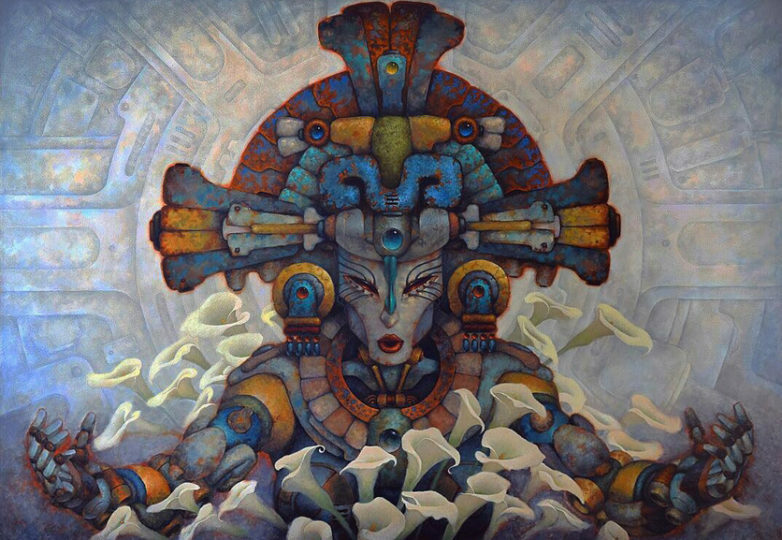 In addition to his Mesoamerican concepts, technique is a crucial element for Cruz’s artwork, although it has varied over the years. Cruz mainly uses acrylic, oils, pencils and watercolors, but he has started to experiment with making sculptures, and using different materials like papers metals, woods, plastic, and recycled objects. Cruz experiences a mixture of joy, uncertainty, satisfaction and doubt whenever exhibits, but he said the utmost gratification for him comes from the feeling of having transported his audience to an era they have never been to before.